The Dignified Rant: Breaking Apart at the Seams? Breaking Apart at the Seams? Do read it all. By the time we get to the Syria part of our anti-ISIL war, ISIL might have swept into Damascus. In Idlib province, where jihadis took two Syrian bases recently, reports are that the Syrians lost 100 men, had 120 captured (who were abused on video), but 100 escaped south. How long can Assad's army hold together with defeats like that? There is another Syrian base hanging on in the east that is probably one big assault from being a massacre. Remember, during the long Iraq and Afghanistan campaigns, we never once lost a base to enemy assault. If Assad's forces crack, could he still hold in the Alawite heartland back to the coast even as mostly jihadi rebels sweep into the rest of western Syria, leaving just our southern front to screen the Jordanian border? This is a problem. Even when the rebels were reeling and the Assad forces were on visible offense, I doubted that his troops could endure the casualties needed to finally win the war. Note the concentration of regime-controlled areas from the coast inland. This would be the core of a final stand if Assad decides he can't afford to control the capital, Damascus, and points south and east. The problem is that Assad might not be able to retreat his ground forces in good order after taking a beating when he might have successfully retreated to this core Alawite Syria a couple years ago. 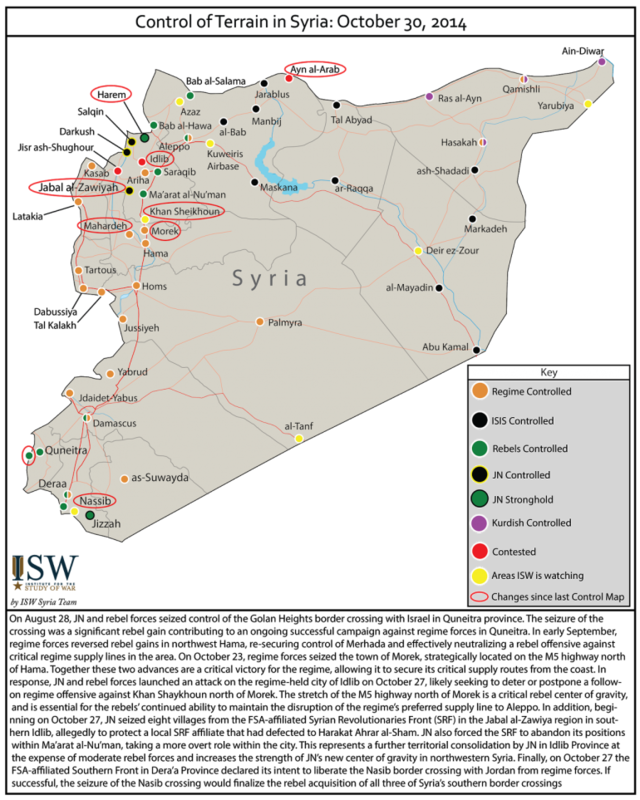 UPDATE: To be clear, if Assad has to shrink down his area of control to a core Alawite Syria, I imagine Homs would be the southeastern point of that kingdom, with the Damascus region and the border regions with Lebanon and Israel south of there abandoned. So watch to see if Assad transfers the capital to the coast, or someplace near that.